I listened to this CD over and over again when I was pregnant. So hearing it takes me right back to that place when she was here. I can't hear it without tears coming to my eyes. Music is so powerful in how it can make you feel the way you felt when you heard that song at another time in life. I have such a precious memory from my pregnancy that has to do with this CD. One day shortly after I got this album, I was driving over to a friend's house for a visit. She lives about 30 minutes away, so I had quite a bit of time in the car to listen to the CD. I turned it up so loud and both Lily and I were enjoying it so much. She moved around in my belly more than she ever had before when I played this music for her. She loved it. It makes me love this album even more, knowing that Lily loved it too... and that she truly did hear it during her time in the womb. Babies love hearing music in the womb and oftentimes remember it after they are born. I bet Lily would have remembered this music and that it would still be a favorite of hers to this day, and all through the years. I wish I had countless memories of playing this CD for Lily outside the womb... but I am truly so thankful for this one sweet memory of her dancing for her mommy while listening to this lovely music. Her perfect little ears heard these very songs that I am listening to right now. She was real. She loved music like her mother (and father). It gives me a sweet connection with her. 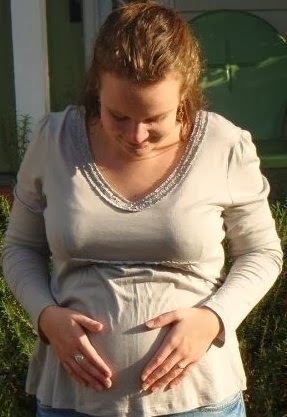 This photo was taken in November 2009, around the time I got the CD and when Lily danced around so wildly in my belly. It is my favorite photo of me pregnant. Anyways, the CD is hauntingly beautiful... especially because of the memories for me. For a while, I didn't really want to share this album with others because it's one of the few things in the world that is directly connected to Lily (it may sound silly, I know). But, it feels like it's her CD. It's symbolic of my short, sacred time with her. However, I have decided that sharing it with others makes me feel as if I'm sharing a piece of Lily with them. They probably wouldn't be hearing it if it weren't for me sharing it with them. And I wouldn't have heard it if it weren't for Lily. Here's a YouTube video that has little snippets of each song from the album so you can get an idea of what it sounds like. I never imagined just what forever would come to mean... that the rest of my days on earth would be spent without her. Yet, my love will stretch into eternity... and it is there we will meet again. Forever.